So recently I've learned about fairy chess and I've decided to write a puzzle based around the topic. 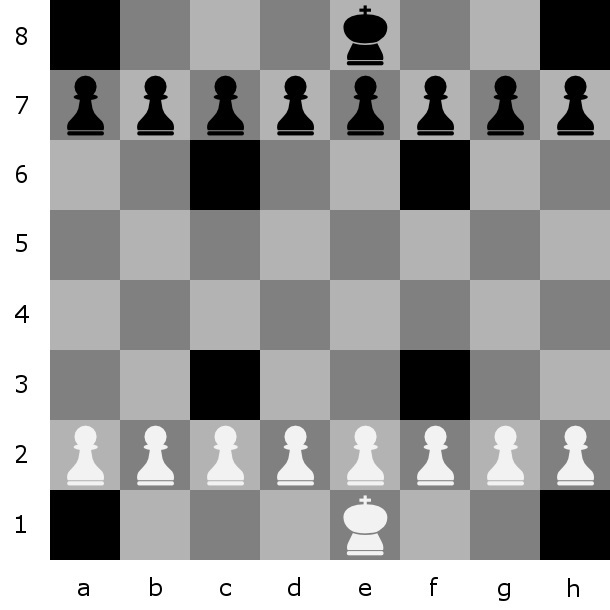 Today's variation features a chess board which is missing eight squares (A1, A8, C3, C6, F3, F6, H1, and H8). The black squares are missing and thus pieces cannot move to these squares. The pawns on A7 and H2 must make opening movements like a knight piece (and they must be moved at least once in the game). If either side fails to move A7 or H2 at least once, the side that fails to do so loses regardless of checkmate. If both sides forget to move A7 or H2 the match is a draw. All pawns move like a traditional king piece (one square in any direction). They can only capture on a forward diagonal square. En passant is not a valid capture. The king must be moved every second turn. The king cannot put itself in check. The king cannot check the other king. The king cannot be used in checkmate. However, as I mentioned; the king is quite dysfunctional and every third movement of the king will sequentially change the way it moves (starting with it's next movement). What is the shortest mate possible on either side when adhering to these rules? as @Jannis says, instant mate. For example, a2-a3, a7-b5. Now it's white's turn. White's king has to move as a bishop but can't. And Black has moved a7 as required ("if either side fails to move a7 or h2..."). Black wins. Not what you meant? :-) Okay. White king is on h4, a black pawn is on g5 attacking it. But the king still has to move left-to-right as a bishop, so it has no escape. Checkmate. Also black has made the required a7 move, while white has not made the a2 move. If you actually have to attack the king to win, and if the king can only move left-right as a bishop, then h4 is the closest spot you could attack, and black need two moves to get there, plus black's required a7 move, plus black's required king moves in between. Five moves minimum. Not the answer you're looking for? Browse other questions tagged logical-deduction chess checkerboard or ask your own question.